It’s that time of year again — time to talk about weather-related health complications, like heat exhaustion and heatstroke. One look at the weather map shows that most of the country is baking, with heat records being shattered far and wide. While seniors are more likely to be affected by high temperatures and heat-related problems than younger people, heat exhaustion and heat stroke can affect anyone if the conditions are right. Heat stress occurs when our body is unable to cool itself enough to maintain a healthy temperature. 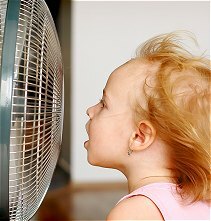 Normally, the body cools itself by sweating, but sometimes sweating isn’t enough and the body temperature keeps rising. Heat-related illness can range from mild conditions such as a rash or cramps to very serious conditions such as heat stroke, which can kill. Overexertion in hot weather, sun or bushfire exposure, and exercising or working in hot, poorly ventilated or confined areas can increase your risk of heat stress. Heat can also make an existing medical condition worse, for example heart disease. 1. Drink Extra Fluids – To prevent dehydration, it’s generally recommended to 33ml of water per kilo of body weight per day. For example, a 75kg person needs to drink a minimum of 2.4 litres per day. This needs to be increased to 40ml per kilo of body weight of hot days. Dehydration is bad enough but combine it with a summer heat wave, and you have the perfect storm for heat exhaustion. Click here to read more about your optimal water intake. 2. Take additional precautions when exercising or working outdoors – The general recommendation is to drink 1 Litre of fluid two hours before exercise, and consider adding another 500ml of water or sports drink right before exercise. During exercise, you should consume another litre of water every 20 minutes even if you don’t feel thirsty. 3. Avoid fluids containing either caffeine or alcohol, because both substances can make you lose more fluids and worsen heat exhaustion. If you have epilepsy or heart, kidney, or liver disease; are on fluid-restricted diets; or have a problem with fluid retention, check with your doctor before increasing liquid intake. 4. Replace Lost Electrolytes – Because heat-related illness also can result from salt depletion, adding an electrolyte-rich powder to your water during periods of extreme heat and humidity is a must. Medlab ORS Biotic is an Oral Rehydration Solution to replace fluids lost due to vomiting, diarrhoea and strenuous physical activity, providing essential electrolytes together with selected probiotic species to provide therapeutic support for various triggers of diarrhoea and associated symptoms. Other electrolyte formulas include IsoWhey Sports Electrolyte Formula or Endurance and Rehydration Formula. They are both great tasting electrolyte formulas for the replacement of fluid and essential electrolytes like sodium and potassium. 5. Add Cool Foods To Your Diet – Traditional Chinese Medicine (TCM) classifies food according to its energetic qualities of temperature, taste, and ability to moisten and strengthen the body. Food with cool and cold properties can clear heat, reduce toxins, and generate body fluids. In general, cooling foods tend towards the green end of the spectrum – lettuce, cucumbers, and watercress are some of the coolest – the added benefit of cool greens is if you are drinking a lot of alcohol over the party season, these lovely leafys will be just the thing that your poor alcohol filter – the liver – needs to help detox between parties. 6. Dress for The Heat – Wear loose, breathable clothing, such as cotton fabric. Tight clothes and synthetic fabrics can trap heat next to your skin and make it difficult for your body to cool itself. 7. Treat Your Feet – Use a bucket or dishpan for cooling footbaths. You may be surprised at how refreshing it is to soak your feet for 20 minutes or so in cool water. You can also wrap your feet in cold, damp towels for a similar effect. By taking a few commonsense precautions and doing a bit of planning, you can enjoy the long, lazy days of summer without worrying about the heat or letting it affect your health. Just remember: Stay hydrated and as cool as possible, and arrange your schedule to avoid the peak-heat hours. Before you know it, it will be autumn, and heat waves will be a thing of the past. Most help articles on the web are inaccurate or inecohrent. Not this! We would love to hear from you but please don’t put your URL or business name in the comment text as it looks like spam and will be blocked. Have fun and thanks for adding to the conversation.